I doubt I could have found a clearer example of what is wrong with our society, than this issue, the way it was brought to light and the response by Woolworths. If you overlook the warm and fuzzy feelings that a few do-gooders will allow themselves when they post their expressions of indignation over the issue, and the little power trip that the public servant football team members might enjoy having created this little crusade, no good purpose is served by this. It will only serve to (quite rightly) piss off a whole segment of our society. And it will set up the very people who it seeks to protect, as the focus for that anger. In the first place, the sentiment expressed isn’t racist at all, unless one CHOOSES to regard it as such. 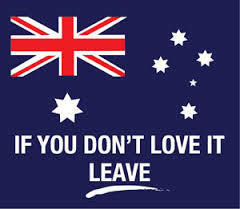 It is in fact, an expression of national pride and unity, aimed at those who are perceived to be seeking to change the core values that make our country what it is, an egalitarian society that values personal freedom, mateship and a fair go for all. It is an opinion which people are entitled to hold (at least I THINK we are still allowed to hold our own opinions; I probably should check with Tony). It is a popular view amongst a sector of society which seems to be growing. They have what I would describe as neo-nationalist leanings. This group of people will be incensed by this issue, They will rightly regard it as another case where their rights of expression are being attacked in the name of protecting the very people who they see as threatening their nation, their way of life and their national identity. The neo nationalist element within society is already angry, they are growing in numbers and they are seeking to be heard amongst mainstream society. They don’t seem to consider that they, or their beliefs are being served or protected by politicians from any area of Australian politics. They feel marginalised. They include people who’s views might be thought of as ‘fundamentalist’ and I believe we ignore them at our peril. A quick look at the Facebook page ‘Take Back Australia’ will provide an introduction to this segment of our community. Whether you disagree with their views or not, they (like all Australians) have an opinion. Seeking to stifle their right to express their views will only serve to validate and reinforce them. There was clearly nothing illegal, or even particularly anti-social in the message on this taboo singlet. What about the supposed ‘victims’ of the attitude implied by the message? This issue wasn’t raised by some minority ethnic group who were ‘offended’ by the message. It was raised by a member of a Canberra football team who was away with his mates on a fishing trip. And he/they, being all offended, managed to kick up a stink and apparently mobilise the social media crusader army, to the point where Woolworths (disappointingly) are falling over themselves to apologise and to distance themselves from the issue. But while the footballer and others will get the credit for being so very non-racist and fighting the good fight, it is the very group who they imagine they are helping who will, yet again, be blamed for being the cause of this upset, of impinging the rights of other Australians to express their honest opinion, and of threatening the Australian way of life by being ‘offended’ ….. yet again.